The decision to offer a sale merging two of the nation's leading Quarter Horse performance and breeding operations has proven to be the right one. Myers Performance Horses, long established as the nation's leading 2-year-old prospect program and home to $9 million leading sire Frenchmans Guy, joined forces with the Copper Spring Ranch for their 2015 Performance Horse Sale. The auction was Saturday, August 22 at the spacious CSR Indoor Performance Arena near Bozeman, Montana offering 59 head including a majority of well-started arena prospects. The performance horse market is huge and records were definitely broken. The 54 head changing hands cashed in approximately $1.5 million for an overall average of $27,306 selling to 18 states and Canada. Myers Performance Horses, owned by Bill and Deb Myers along with their sons Chad, Billy, Brandon and Brady from near St. Onge, South Dakota, stand the still-vibrant 28-year-old leading sire Frenchmans Guy, along with A Smooth Guy and Cowboys Cartel SI 93. They have recently introduced their junior sires Ima Special Kindaguy and This Guyz A Keeper, both promising young sons of Frenchmans Guy. Two and 3-year-old arena prospects and yearling stallion prospects sired by the three senior sires and World Speed AA were included in their 2015 sale offering. Copper Spring Ranch, a state-of-the-art facility designed for the breeding and training activities they offer, is owned by Klein and Karen Gilhousen. Managers Brian and Lisa Anderson oversee the daily ranch operation and Dr. Chris Ray operates his Equine Services at the updated veterinary clinic located right on the ranch. They stand the proven producer Prime Talent SI 107 – a multiple stakes winner and race sire of nearly $1.5 million in earnings with numerous AAAT racehorses. Topping the 2015 Myers Ranch/Copper Spring Ranch Performance Horse Sale was a 2013 buckskin mare sired by the CSR stallion Prime Talent. Explosive Talent, paid in full to the Future Fortunes and WPRA Pro Elite Stallion Incentive programs, left the ring on a record-breaking bid of $100,000 from the Cok Family from Montana. 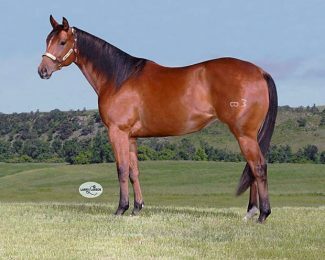 The eye catching mare is out of the CSR broodmare Blondies Dy Na Mite – a daughter of Dealing An Ace SI 96 out of an Oklahoma Fuel SI 108 daughter. The CSR second high-seller was Take Me Ta Fame, a 2013 bay gelding by Leading Sire Dash Ta Fame SI 113 and out of Betta Takemeserious. Her dam is by Frenchmans Guy and a full sister to BFA World Champion Futurity Champion Guys Cash Perks. He found a home in Florida on a bid of $48,000 from the Hatch Family. The CSR consignments sired by Prime Talent had an overall sale average of $21,036. Topping the Myers Ranch consignments was a daughter of A Smooth Guy – a futurity and slot race champion sire. He was the 2013 Future Fortunes Champion Juvenile Sire at the BFA World Championship and the 2015 Future Fortunes Champion Freshman Sire at the Old Fort Days in Arkansas. Guyz Smooth Amber, a 2013 bay mare, is out of their perennial producer Amber Holland SI 88 by Holland Ease SI 109. The three-quarter sister to Guys Amberetto, already proving herself in the early 2015 futurities, caught the eye of repeat buyer Harry LaToush from Kansas and a final bid of $56,000. The A Smooth Guy consignments averaged a strong $35,700 with many going into the training programs of the nation's leading barrel racing trainers. The Frenchmans Guy consignments broke all records with an amazing $41,714 average and two 2-year-old daughters left the ring on bids of $49,000. Flits French Blondie, out of the mare Two Bit Flit, an own daughter of Fire Water Flit SI 86, found a new home with the Plundel's from Iowa. Out of the Myers Ranch broodmare No Shake For Deb by Royal Shake Em SI 104, the gray mare Guys Girls Shakem Up drew considerable attention and is now in Texas with the Hill Family. Both prospects are enrolled in the Future Fortunes program. 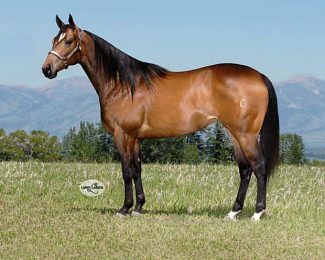 Their ranch sire Cowboys Cartel SI 93 is a son of World Champion Producer Corona Cartel SI 97 and out of Multiple World Champion Race Mare Dashing Folly SI 108. His consignments commanded an impressive average of $30,250 and his top seller was Cowgirls Luv Cowboys, a 2013 Bay Mare out of Paddys Irish O Lena by Paddys Irish Whiskey. Her bid of $54,000 from the Howes Family takes her to a new home in the Canadian Province of Alberta. Auctioneer for the 2015 sale was Lynn Weishaar, Reva, South Dakota, and Aunnouncer was John E. Johnson from Piedmont, South Dakota. Clerking, video and live Internet coverage of the sale was handled by Frontier Stockyards, Miles City, Montana.